Sometimes, an interview just clicks. James Garner and I communicated directly only once, during an extended conversation for a 2004 cover-story profile I wrote for Cowboys & Indians magazine. But right from the start, I felt like I was conversing with an old friend who was forthcoming and unfiltered. Maybe it was because we discovered we had something in common – each of us lost his mother at an early age, dealt with an abusive stepmother, and remained forever shaped by those tragedies. Or maybe, just maybe, Garner turned on his irresistible charm for anyone and everyone he ever met. Whatever the reason, he was an exceptionally gracious gentleman, and an absolute dream of an interview subject, while we chatted. It my custom to celebrate lives, not mourn deaths. 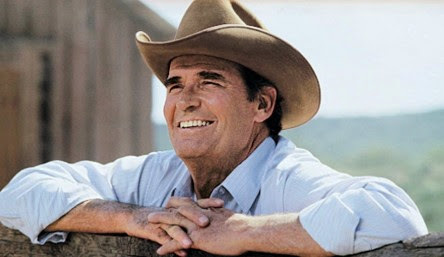 On the occasion of James Garner’s passing at age 86, I would like to recall the man and his work by sharing this interview. James Garner would have you believe that he simply lucked into acting more than 50 years ago, and has been coasting along ever since. Which, he insists, is perfectly all right by him. The work isn’t terribly demanding – well, except for the busted knees, sprained legs and other on-the-set injuries – and the pay is great. Better still, there’s no mandatory retirement age. But that doesn’t mean the man still known to millions of fans as Bret Maverick or Jim Rockford is ready to ride off into the sunset. Even now, a half-century after his acting debut in the premiere Broadway production of The Caine Mutiny Court-Martial, Garner is too busy adding credits to his lengthy resume to think much about moseying off to The Old Actors' Home. Almost in the same breath, however, he insists that he has never thought of himself as a workaholic, or even as especially ambitious. To hear him talk, he has never – repeat, never – been stressed for success. “Actually,” Garner says, “I don’t take success very well, because I know it’s fleeting. And the next day, it can all fall apart. I know that, too. So I don’t get too high – and I don’t get too low. You get through the world a lot easier that way. By the age of eight, he already was working at odd jobs -- mowing lawns, mopping floors – to provide his share of income for his Depression-strapped family. Later, as the Bumgarners moved West, young Jim toiled in the oil fields of Texas, then laid carpet with his father in Los Angeles. In the ’40s, he says, “I met this guy, Paul Gregory, who was a soda jerk at the Gotham Drug Store on Hollywood Boulevard while I was working in a Shell service station a block away. I used to eat my lunches over at the drug store, and he always thought I should be an actor. But I didn’t want to have any part of it. At any rate, he said he was going to be a producer, and blah, blah, blah, blah. Garner was wounded in action, and earned a Purple Heart. All of which, he says only half-jokingly, fully prepared him for the rough-and-tumble world of showbiz. He didn’t flinch during the high-stakes legal wrangling when, in 1960, he walked away from his Maverick TV series over a salary dispute. And he didn’t back down when, years later, he waged a more protracted legal battle to free himself from the debilitating wear and tear of The Rockford Files. “I always have been very independent. I’m not going to let anybody intimidate me. Because they can’t. Some of the toughest have tried. But, look, in Korea, they were shooting at me. They even hit me a couple of times. After that – what else can do they do to me? After returning to Los Angeles from Korea, Garner sought work with an oil company hiring for new enterprises in Saudi Arabia. “But they didn’t want roughnecks, they wanted geologists. I thought, ‘Well, I got to stick with laying carpets,’ which I didn’t want to do. Gregory, a talent agent as well as a producer, signed his friend to a contract on the spot. After a couple of false starts – “He got me an audition over at Columbia, which I was just awful at!” – and a professional name change, James Garner got an enormous break by being cast in The Caine Mutiny Court-Martial, which Herman Wouk himself adapted from a portion of his own novel. Mind you, Garner had a non-speaking role, as one six attentive members of a Court of Inquiry. But that placed him in the perfect position to closely observe Henry Fonda and Lloyd Nolan in lead roles during months of performances in Los Angeles and New York. “I learned a lot about acting just sitting there night after night,” Garner says. He proved to be such an apt pupil that director Charles Laughton – yes, that Charles Laughton, the infamous Capt. Bligh of 1935’s Mutiny on the Bounty – cast Garner as the defense counsel, one of the play’s key roles, in the national touring company. The earning-while-learning process continued apace. “One day during rehearsals,” Garner recalls, “Laughton told me, ‘James, I wish you’d come to lunch with me. I need to talk with you.’ And I thought, ‘Oh, boy, I’m going to get it here.’ Because I knew I was terrible. “The thing to remember,” Garner says, “is that when I did the original Maverick series, there were already 16 or 17 Westerns on television. Now that’s a lot of Westerns. They were the whole basis for television at the time. But we came along and put our tongues in our cheeks and laughed at them. Everything on these other shows were clichés – they’d already done it all – so they were easy to make fun of. Garner looks back on Maverick with a reasonable degree of pride, but relatively little nostalgia. In subsequent years, he would reprise the raffish gambler in Bret Maverick (1981-82), a short-lived series revival. And he eventually played a smartly-conceived supporting part in a 1994 movie spin-off starring Mel Gibson. But for a long time after he departed the original series -- co-star Jack Kelly continued on as the equally devious Bart Maverick for the show’s final season – Garner took great pains to distance himself from the role that had made him famous. No big deal: Garner has found steady employment ever since in scads of other films, ranging from playful satires (The Thrill of It All, Support Your Local Sheriff) and romantic comedies (How Sweet It Is, Murphy’s Romance) to gritty action dramas (Duel at Diablo, Hour of the Gun) to brawny adventure epics (The Great Escape, Grand Prix). And while the majority of his roles have been modern-day characters – in The Notebook, he plays a World War II vet with close ties to a nursing home resident (Gena Rowlands) who’s stricken with Alzheimer’s Disease -- he continues to be closely identified with the Western genre. To be sure, Garner doesn’t have nice things to say about every Western on his resume. Mention A Man Called Sledge, a 1970 Spaghetti Western in which he co-starred with Dennis Weaver and Claude Akins, and he’ll admit that, even during production, he and others already were calling it A Man Called Sludge. And then there was Sunset, the 1988 Blake Edwards film in which he played an aging Wyatt Earp to Bruce Willis’ Hollywood cowboy Tom Mix. “I hated that movie,” Garner bluntly admits. “Let me tell you something: Blake Edwards wanted to do that picture with Robert Duvall and I. Now just think about that – wouldn’t that have been a whole different picture? Despite that unpleasant experience, Garner sounds wistful as he bemoans the current scarcity of Western movies and TV shows. “I hate that they’re as rare as hen’s teeth,” he says. “They don’t have many of them on television, I suppose, because they appeal to older viewers. And the networks aren’t interested in the older viewers – even though we’ve got more of them than we have younger ones. In the view of many critics and fans, Garner gave his greatest performance as an anti-hero in The Americanization of Emily, the acclaimed 1964 dramedy – written by Paddy Chayefsky, directed by Arthur Hiller – about a cynical Navy lieutenant commander who’s exploited as an extremely reluctant hero during World War II. Despite the marque allure of Garner and co-star Julie Andrews, Emily was something less than a boffo box-office success in its time. During the decades since its theatrical release, however, it has gained legions of admirers. “The Americanization of Emily actually made money – though not much,” Garner says. “But that’s my favorite film. In fact, it’s mine, it’s Julie’s -- and I think it’s the favorite of more than a few other people who were involved with it. “If you look at it, it’s very much like stuff that’s in the news today. But it was very daring back then. I mean, you start talking anti-war when they’re already involved in Vietnam and everything like that – you’re daring. But there were a lot of people out there who thought our way. Thor is a woman. Now what? From me and Bill Pullman: Happy Independence Day!